I honestly didn’t think it would be more than seven months between posts (if I did I wouldn’t have left you with such a downer). No special reason for the long hiatus. Actually just all the usual reasons. 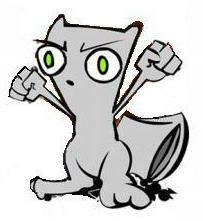 Work got busier, I got more tired, and I had less creative energy leftover from working on the new book. But this week I’m in a place with boundless creative energy. I just finished the first day of the Bridges Math + Art conference in Waterloo. There are literally not enough hours in the day to talk to all of the interesting people here. Today I went to talks on fonts, fractals, and fun with OK Go. I’ve been playing around with fractal genetic codes from the Fractals for the Classroom series. Simple patterns and rotations that make some interesting forms as you keep iterating. Anyone see a Canadian maple leaf in this one? Since this post veers into very inside baseball territory, let’s start with how we got here. Have you ever had that book that you had to take with you everywhere? It could be the latest exciting story you were reading, or a really handy reference guide, or something with deep sentimental value. Maybe this book has been a passenger in your car; you take it out to lunch even though you know you’re not going to read it while you eat because you might get sauce on the pages. You just want to pick this book up and hold it, flip through the pages, feel the weight of it as you toss it from hand to hand. Maybe you even… smell the pages. That sort of book. I know, it’s cliché. Everyone loves this book and has a copy next to their nightstand. No? Just me, then? Okay. 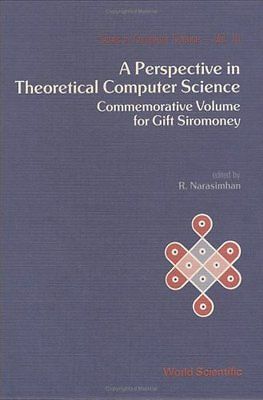 Why this book is important is that it is the end of a long trail of looking through references in papers, from a stray mention of Kolam patterns in a L-System book by Przemyslaw Prusinkiewicz to the work of Darrah Chavey, Paulus Gerdes, Marcia Ascher and countless others. This book has some of the best grounding in the computer science behind drawing curved line patterns using context-free and array grammars, and contains images from work in the field. It is perfect because it is obscure and exactly the right book at the right time, even though it was written almost 30 years ago. Which brings me to mathematical notation. As a fledging programmer one of the first things they teach you is to use meaningful variable names. A variable is an object that holds a value. So if I’m counting oranges, I might have a variable called numOranges. What I wouldn’t have is a variable called ‘o’. ‘o’ could be anything: orangutans, oscilloscopes, Timothy Olyphants, etc. Math on the other hand tends to use one letter symbols all the time. You’d think this was okay, because the symbols only ever have one meaning. A ‘+’ symbol is a plus symbol. ‘π’ is pi the number. Except when π is an iteration symbol, or a time stage symbol. And ‘x’ means multiplication, until you graduate to Algebra where a dot is now multiply and x is a variable. And ‘+’ could mean turn right if we’re talking L-systems. Math papers in general make an assumption about mathematicians that isn’t always correct. It assumes they can write in a way that can be understood. They understand their field technically, but not in common language, or even readable technical language. Now I’m not picking on the Siromoney book too much. The text is very readable. Some of the paper’s problems come from problems in reproduction. Older books like this one had papers submitted physically and then photocopied into a full book. This was done a typewriter or an early word-processor (courier font is kind of a tip off that we’re looking at a typewriter), so some subscripts and superscripts are incorrect, and some symbols have to be hand-drawn after the paper is typed. The bigger offenders are the ones who use a symbol without any explanation. I remember after staring at it for a few seconds that ∪ means union, but it might be nice to have some handy definitions at the back or in the text. Defining your terms is often a necessary part of making any proof, or explaining any new concept. It never hurts to make sure your audience is on the same page you are. Especially if you plan to have terms mean something other than their common meaning, like ∪ meaning recursive level, or some such. For a while now, my goal with this new book has been to take complicated concepts and explain them in ways that make sense to everyone. These papers often do the opposite, take something simple and explain it in a complicated way. Fractals actually aren’t that hard to understand. More and more after reading these papers it feels like I’m translating from some arcane and obscure language, with symbols that change in meaning from one place to another. It’s confusing, and it doesn’t have to be this way. We can be rigorous AND we can be clear. If you can explain a concept to a 6th grader, then you really understand it. SPOILER POLICY FOR THIS REVIEW: Most of the plot details I mention in this review are things we knew from the trailers (casting, fate of Enterprise, name of villain, etc.) I plan to talk a bit about the specifics of the Enterprise sequence, but I’ll avoid some details about the villain. The basics of Jaylah are discussed, as well as some of the cast pairings that happen in the middle section of the movie. If you’re spoiler sensitive, avoid this post until you’ve seen the movie. If you want a sense of what’s cool, what could have been done better, and whether you should go see this movie (you should), then read on. Right from the first trailer and the announcement of this film’s director a lot of fans were worried that we were getting Star Trek: The Fast and the Furious, a generic action movie instead of true trek spirit we’ve come to know and love. Simon Pegg’s script and a lot of sly references do what they can to challenge that expectation and there are bits and pieces of something greater, but most of the middle section is exactly what we expected from Justin Lin. But the movie is still eminently watchable. The fate of the Enterprise: There’s a real “oh sh-t!” moment early on in the sequence that my wife actually caught a few seconds before the rest of the audience. The design of the Enterprise throughout the decades has often been criticized for putting the nacelles on long delicate arms. And in Beyond we see the consequences of that choice. It actually takes a good ten or so minutes from initial battle till everything comes crashing down as the Enterprise is picked apart by a swarm of ships unlike anything they’ve ever encountered. Most Trek battles are naval engagements, two heavy cruisers duking it out until one is victorious. The swarm of enemy ships in this movie is a force of nature, one that will be next to impossible to defeat. Everyone gets a good moment, from Scotty’s clever escape, to Uhura’s battle with the baddie, to Kirk saying a last goodbye to the bridge. Everything up through this moment is the Trek we love. Let’s wander around on a planet for a while: There was a lot of potential in the middle act of this movie, and we get glimpses of it through some character beats. Most of the crew is picked off by Krall and huddled together in cells pretty early, but a few are able to escape on their own or with a buddy. We see some traditional and unexpected pairings here: Kirk and Chekov, Spock and McCoy, Scotty and Jaylah. There’s some real potential for interaction and character development in these sequences, but the best we get (as expected) is Spock and McCoy. Their grudging respect for each other is explored, as well as Spock dealing with a big loss. I’ve been a fan of Urban’s McCoy and feel like he’s been underused until this movie. 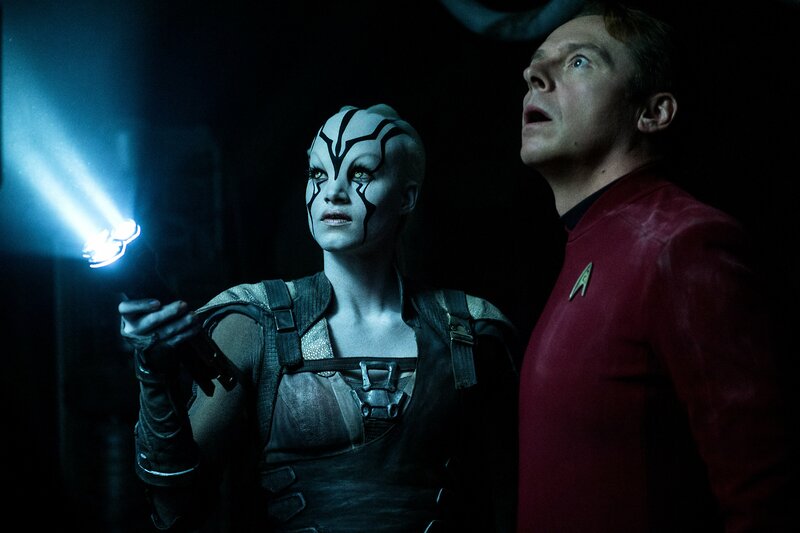 The Kirk and Chekov stuff is all action, and Scotty and Jaylah are mostly played for laughs. Uhura, Sulu, and rest of crew in Krall’s camp is less compelling, though Uhura’s one-on-one’s against the villain aren’t bad. New life-forms: Jaylah’s a nice character. She’s got a cool character design. Her outfit’s not exploitative. She’s shown as being a capable engineering novice and a fighter. She calls Kirk “James T.” Overall, not a bad effort. Simon Pegg mentioned on Late Night with Seth Meyers that her name comes from her script designation (Jennifer Lawrence from Winter’s Bone) and I don’t know if we would have made more of a connection with this character if it was actually Jay Law. Her development is a little lacking, but I look forward to seeing how potential future movies use her (or at least the comic books). Ordering off the menu: Idris Elba on the other hand, is buried in the makeup and that voice he put on for this movie. Whatever you think of Cumberbatch’s Khan, you were getting everything that actor had to offer as a sympathetic villain. There’s so much we could have gotten from Idris, even just from his voice, that his slow, spittle-spewing performance didn’t give us. On Fallon, Idris remarked that you didn’t really have to act when you looked like his character, which makes me wonder why they used someone as talented as him for the role. If you hadn’t told me it was Idris, I wouldn’t have known for much of the movie. Callbacks: The trek references in this movie were largely from one of the least popular series: Star Trek: Enterprise. There were a lot of good TOS refs as well. The Enterprise callbacks make sense, since technically the prime and Abrams (Kelvin) timelines share that common ancestry. There was one choice of music in a sequence toward the end of the movie that came off as very hokey, especially considering what it was being used to do. That was probably the most Fast and Furious the movie got. Yes, I know that First Contact used “Magic Carpet Ride” in a sequence, but it made way more sense in context than the moment in Beyond. 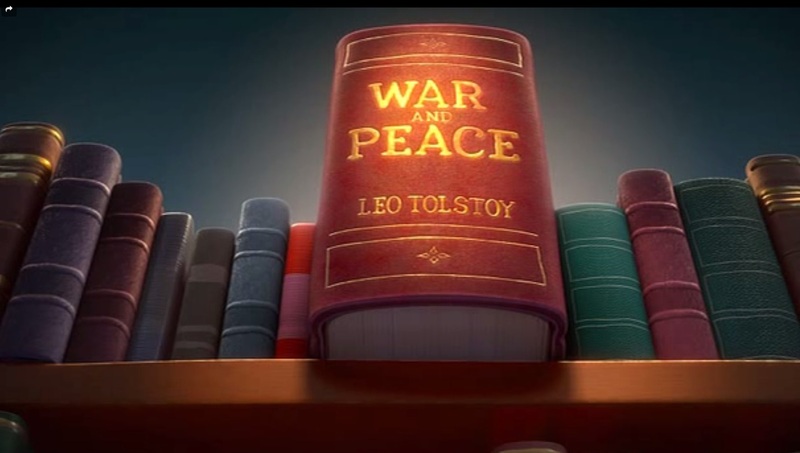 The best moments are the movie’s tribute to Leonard Nimoy, which is handled with more than just a title card. There’s a moment at the end that really connects with Trek’s 50 year legacy. Raise the stakes: Star Trek (2009) destroyed Vulcan mid-movie. It’d be hard for any movie to rise to that level without repeating itself. Into Darkness did it with a personal character death, Pike being killed by Khan early on. 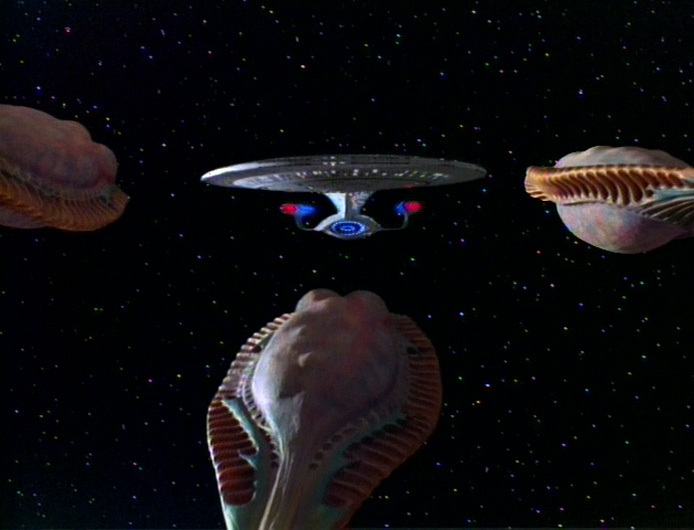 Beyond does shock us early on with the Enterprise attack, but the actual threat of the movie seems relatively minor. Most of our villain’s violence, and the devastating power of his weapon, is implied not shown. The thing to protect is largely significant because it looks cool and has a lot of people on it (oh and Sulu’s husband and daughter who we’ve never seen before, and never talk to). I’m not sure how you correct this point, but since there was less connection with earlier movies or Trek lore, it seemed more generic in a building-smashy way than the previous films. Bottom-line: The movie is fun. There’s a lot of laugh lines. The space action sequences are superb. The planet stuff is more generic, but still fun. We’re back to the curse of the odd numbers, but if you think about it, only 1 and 5 are real stinkers. 3, 7 and 9 are all very watchable. I think Beyond actually most resembles 9 though without the romantical time-freezing bits. It’s definitely still in the top third of Trek movies. I doubt you’ll hate it, and you definitely will want to see it in the theater. Just maybe go for the matinée. “Threshold” is the most notorious episode of Voyager, possibly of all of Star Trek television. Its writers have called it a “royal steaming stinker.” There have been arguments about whether or not it is canon. At best its been called “that silly warp 10 episode.” Over the years I’ve been one of those voices who have piled on this episode, but much like my newfound appreciation for Star Trek V, I now believe that “Threshold” is not only canon, but is in fact the best episode of any Star Trek series*. Quick recap of the plot. Paris breaks warp 10, is everywhere at once in the universe, turns into a lizard, abducts the captain, has babies with the captain, then is restored to humanity by the doctor who shoots him full of anti-protons to eliminate the bad DNA while keeping the good. 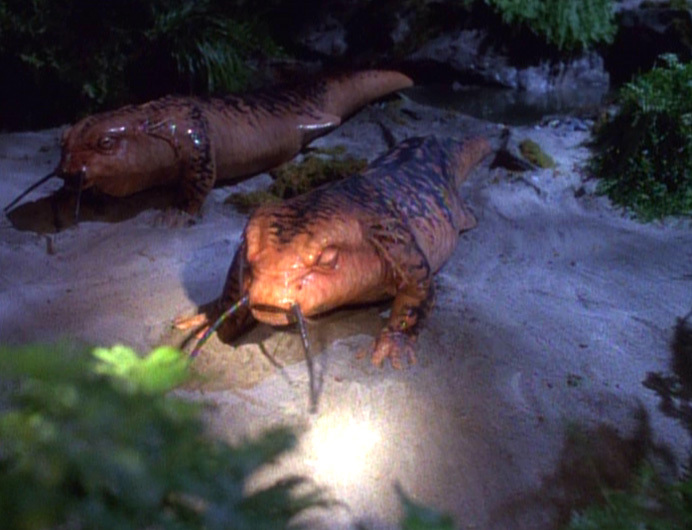 Janeway makes a crack about possibly initiating the mating. The end. To get where I’m coming from you have to consider the two Star Treks. There’s what we think Star Trek is, and there’s the actual show. 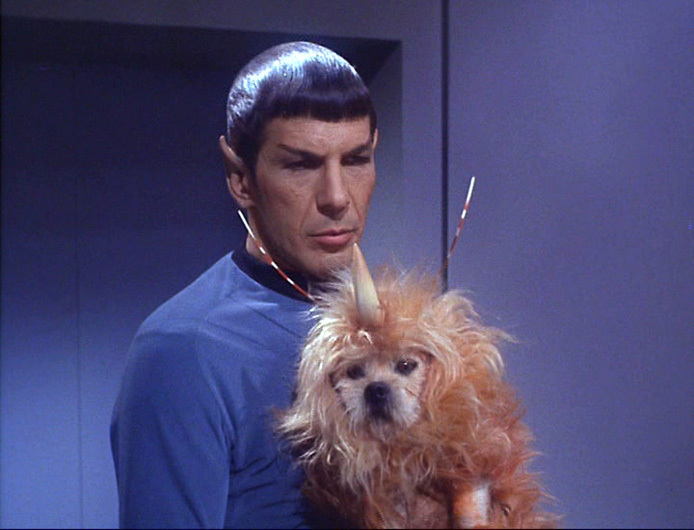 In an EHG canon pitch for the TOS episode “Mirror, Mirror” Adam Grosswirth said that Star Trek manages to be “both good and so bad it’s good at the same time.” I think that’s dead on. Star Trek does raise some interesting social and scientific commentary, even the original series, but it’s also pretty silly. It’s okay to like Star Trek for both those reasons. It’s why I insist on watching TOS episodes with the original special effects instead of the remastered.The silliness is part of the charm, and this episode is no different. For starters, I forgot how funny the Doctor is in this episode. There’s a dry wit and delivery to everything he says, which is good since we spend a lot of time in sickbay. Did you know this episode won an Emmy? It beat DS9’s “The Visitor” for “Outstanding Makeup for a Series.” That should make it worthy of some serious consideration, right? I mean, it takes a lot of work to make pulling out your own tongue believable. I was going to add a picture but I still like you guys more than that. I know a lot of people have argued that the original series went faster than warp 10 on many occasions, but it was established by Gene Roddenberry sometime toward the beginning of TNG (though not before “Where No One Has Gone Before” apparently) that warp 10 is the top barrier. It has something to do with different scales of measurement between the two warp drive numbering systems, but truthfully it’s because TOS threw those numbers out pretty willy-nilly and TNG decided to be a little more consistent. This is the first of several engineering project episodes for Paris and it really establishes him not only as a good helmsman but as a test pilot as well, in the tradition of Chuck Yeager and Zefram Cochrane. There’s even a reference to Chuck Yeager’s sound barrier breaking flight (he had close the cockpit door with a broom handle because of two broken ribs). Paris is almost scrubbed from the flight because of health concerns, but insists on flying anyway. Working on stuff like this is what brought us the Delta Flyer a few years later. It takes him from being just one of the vaguely handsome people on the bridge and makes him interesting, and it establishes his working and personal relationship with Torres early on. That warp 10 would have some unforeseen physiological effects is pretty consistent with the way Star Trek handles these sorts of technological advances. The exact direction is weird to be sure, but no more weird than the virus that devolved everybody on TNG and made Worf into some kind of werewolf-snake thing. And Voyager could have gotten home using this technology. The doctor did develop a treatment. Two people recovered from it. If they’d known the weird evolution thing was coming they could have flown at warp 10, gotten treatment, and been home in time to avoid the Borg. Sure maybe one or two would have stayed lizards but that’s a small price to pay. So leaving TOS out of it let’s take the show that a lot of people think is the best trek, TNG. You remember that episode with the flying space pirogi? 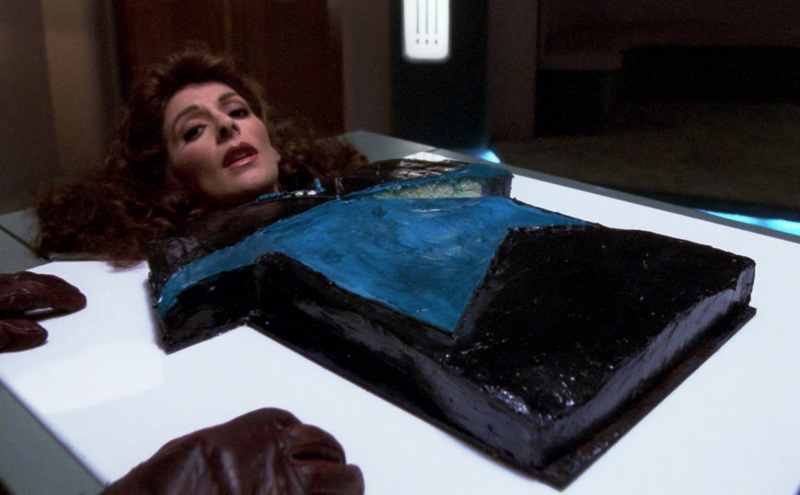 Or how about eating Deanna Troi cake? And okay let’s pick on TOS a little. A dog is an alien? Lizard’s looking pretty good now, right? Though most of these beats were removed from the script, “Threshold” does challenge some assumptions about human evolution. Most of Star Trek, and other sci-fi, assume that a higher form of life means something either basically human, or maybe pure energy. This episode actually flips the script, saying that we might have a deeper understanding of the universe as a simpler form of life. Sure it looks pretty alien to us now, but in a few million years who knows? This is actually an interesting idea, and one that Star Trek or some other show could do more to tackle. At the very least it seems logical to assume that we won’t fully understand the benefits of our next stage of evolution as a species until we encounter them, and we might not know where the human race is really going. That’s an exciting notion. 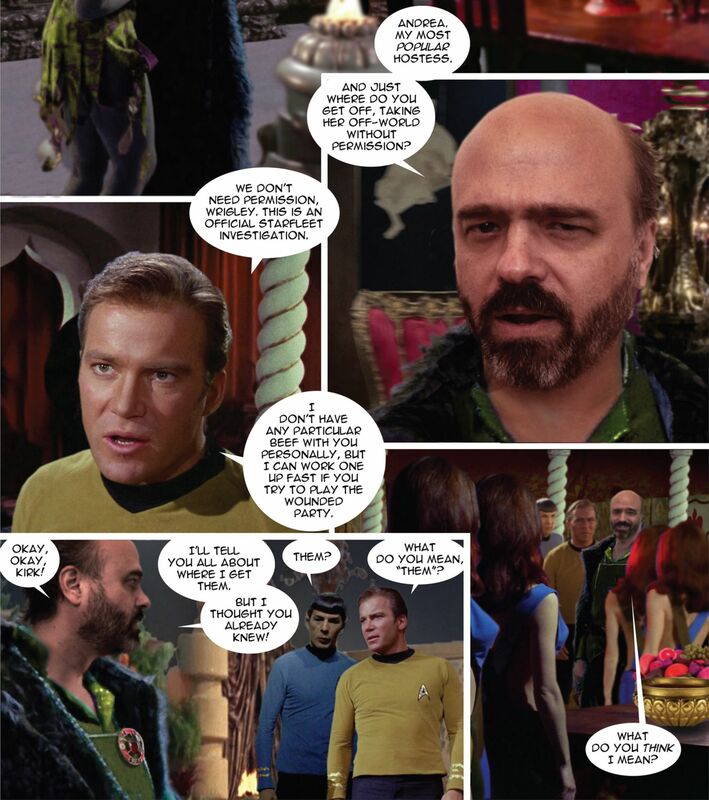 So if I haven’t convinced you that “Threshold” is the best or even a good episode of Star Trek, try this on for size. When Paris is revived from an initial brush with death, he has two hearts. As we know, another Doctor whose name we do not know also has two hearts, and can go anywhere in time or space. Tom Paris just brought Tardis technology to Voyager, and without the annoying grinding sound. *Somehow I managed to finish this without various internal organs trying to leap up and beat my brain to death. Weirdly, I leave this at least convinced it’s not the worst episode of Star Trek. 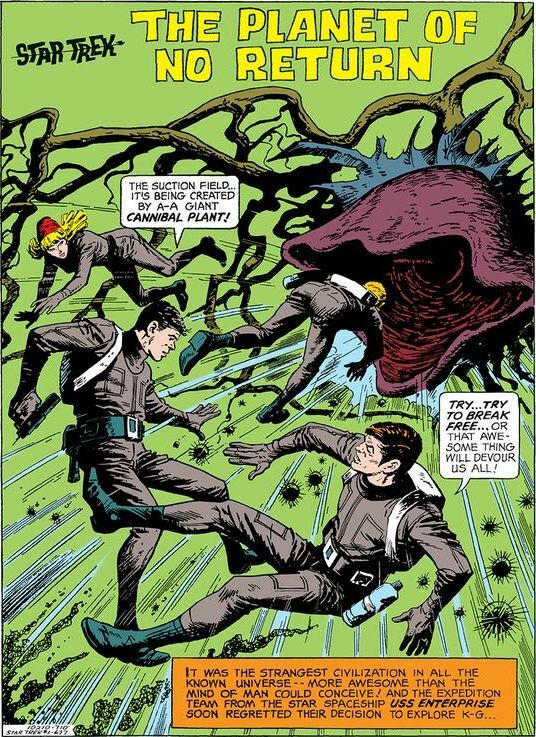 I mean there was that other Voyager episode with the giant flying bacteria. Bleagh.